The news is filled with reports that the Tax Cuts and Jobs Act (TCJA) has spawned “share buybacks” – corporations purchasing their own stock – and opponents of the law have characterized this as evidence of failed policy. A little reflection, however, indicates that share buybacks tell you essentially nothing about the success of the TCJA. Let us stipulate at the outset that the policy goal of the business reforms in the TCJA is to raise the rate of investment in tangible and intangible capital in the United States, increase the growth rate of worker productivity, and therefore increase wages for the middle class. Critics argue that share buybacks are not investment in new inventions, new business models, or new equipment. Similarly, they are not higher wages for workers. Voila! They must indicate failure. This reasoning is incomplete. When firms repurchase their stock, the dollars they pay do not disappear into a black hole. The sellers could easily turn around and invest themselves. Indeed, only about a fifth of corporate-source earnings are distributed to taxable entities (economic code for rich people). That means the vast majority of those earnings is going to things like pension funds, whose incentive is to channel the dollars to the place with the highest return – those firms doing the best investment in inventions, business models, and equipment. In fact, there could be many more intermediaries and many, many links in the investment chain. The bottom line is that success or failure is measured by the final transaction in that chain, not the first. As long as investment in the economy as a whole rises, the TCJA will have done its job. As an aside, it is probably a good thing when there are share buybacks. They suggest that the firm has little in the way of high-return investments to make. 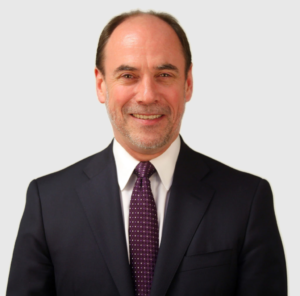 It is far better to avoid having the dollars trapped in a low-return firm and instead have them flow through financial markets to the best investment opportunities. How, then, can one judge success? A simple way is shown in the chart below. The red line shows the contribution (in percentage points) of business investment to growth in gross domestic product (GDP), as measured by a 4-quarter moving average. The clear need is for investment to surge and push up both the growth rate of the economy and investment’s contribution to that growth. How can we see if that is coming? 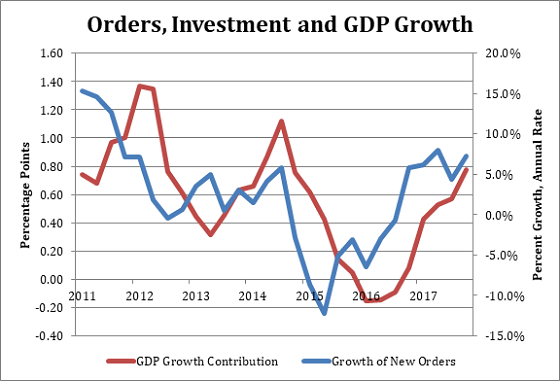 The blue line shows a 4-quarter moving average of new orders for capital goods, which fairly closely tracks the investment. During 2018 it will be interesting to watch the growth rate of new orders for an upturn in response to the policy change. It is a good leading indicator of the success of the TCJA. Share buybacks are not. In 2012, 12.6 percent of workers took family and medical leave for an average of 7.2 weeks, and over half of those workers took leave for personal medical reasons.